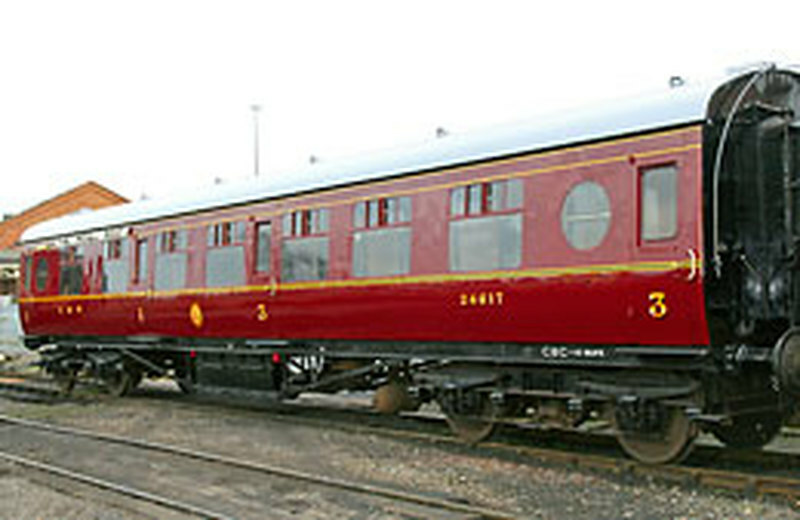 The LMS was leading british railway carriage design in 1938 by building the first batches of all-steel, welded construction coaches. The second world war put this all on hold, and post-war rationing of steel delayed the resumption of this programme. In 1947, the LMS began construction of a new all-steel dual-class carriage, No 24500. It was completed in LMS colours, but without the LMS branding, in early 1948, by which time all the railways then were British Railways. A further 250 were built in the next two years and most were delivered in the new carmine and cream colours. 24617 ran in services on the Western Region until 1968, when it was withdrawn only weeks after a full works overhaul. A combination of Beeching route cuts and new BR Mark One stock, making it surplus to requirements. Four months after its last BR overhaul and repaint, 24617 was delivered to the SVR, having been bought by the LMS&BR Coach Fund.